Kylie Jenner doesn't seem TOO upset with Jordyn Woods. The ex-BFF's were rumored to have fallen out after Jordyn kissed Tristan Thompson which allegedly caused him and Kylie's sister Khloe Kardashian to split. 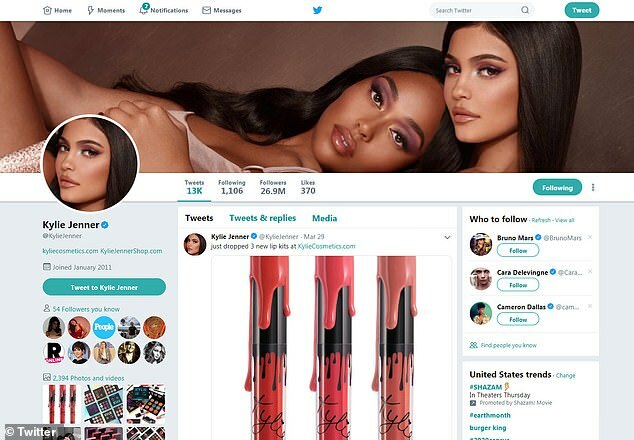 But the makeup mogul, 21, seemed to show some love as her Twitter photo is currently a giant picture of herself and Jordyn, 21. The photograph shows Jordyn leaning on Kylie lie as the two beauties lool=k glamorous with impeccable makeup. Kylie's hand resting on Jordyn as well. Dailymail.com reports the photograph was current as early as Friday. Meanwhile, Kylie defended herself after The New York Times asked if she purposely slashed prices on the Jordy Lip Kit in the wake of the cheating scandal. 'That is just not my character. I would never do something like that and when I saw it, I was like, thrown back,' Kylie confessed. Loyal Kardashian/Jenner fans first noticed the lip gloss and liner item had been slashed in half, from $27 to $13.50, in the days after word spread about the alleged drama. It didn't take long before some customer reviews took a sarcastic and angry tone.